Beagles are born to bark. But if you find it has become too excessive, you can use the following information to help control it. Read on to find out how to stop beagles from barking. If you’ve come to the stage where you need to stop beagles barking, you will already know that there are only so many things you can do to help fix the problem. Beagles have the need to bark – it’s the way they show their feelings. So before you start following the ‘how to stop beagles from barking’ steps, you need to know the reasons behind why they bark in the first place. So from what you can see above, barking is an important part of a beagle’s life and you can’t stop them barking altogether. They have a need to vocalize what they feel. 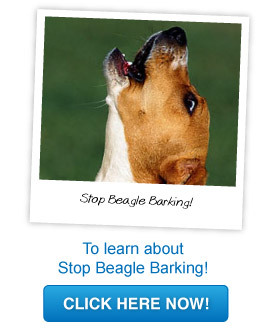 However, if the barking is out of control, the following information will guide you to trying to reduce it. Read on to find out how to stop beagles from barking. What time of the day is your beagle barking? What or who is your beagle barking at? Is there something that sets of your beagle barking? Anxiety: Your beagle may have anxiety issues and will bark until you get home. This could be because you shower them with attention when you get home. Thus you are rewarding them for their barking. To stop this you need to ignore your beagle for around 10 – 15 minutes when you arrive home, stopping the association been praise and barking. Your beagles barking does not have to be a big problem. By using the above tips on your beagle from an early age you can control it. In reward, you will have a healthy and contented beagle to look after!